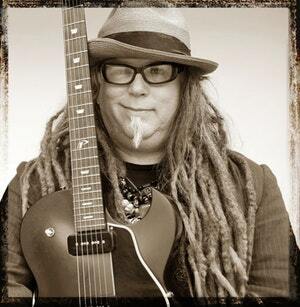 "New Orleans Swamp-Funk AllStar Spectacular"
Papa Mali (born Malcolm Helm Welbourne in Vicksburg, Mississippi, May 6,1957) is a New Orleans based, American singer-songwriter, guitarist and producer. He has been a touring musician and recording artist for decades. Yet, he is probably best known as the front man for 7 Walkers, a band formed in 2009 that includes three musical icons: Grateful Dead founding member and drummer Bill Kreutzmann, The Meters’ founding bassist, George Porter Jr. and lyricist Robert Hunter, who penned most of the Grateful Dead’s classic catalog (along with the late Jerry Garcia) and now co-writes much of 7 Walkers material with Welbourne. Multi-instrumentalist, vocalist and Willie Nelson collaborator, Matt Hubbard completes the line up. Their self-titled debut was released to critical acclaim in November of 2010. Papa Mali is also known for his own live performances and recorded output, most notably his two albums for Fog City Records (2000’s Thunder Chicken and 2007’s Do Your Thing), both produced by Dan Prothero and the latter featuring some of New Orleans’ most legendary musicians. His work as a producer includes 7 Walkers (Response, 2010), The Phenomenal Ruthie Foster (Blue Corn, 2007) and records by Lavelle White, Omar and the Howlers, Wendy Colonna, The Greyhounds and others. Jay Lane is an American drummer from the San Francisco Bay Area. He is a founding member of Furthur, Electric Beethoven as well as the Golden Gate Wingmen with John Kadlecik, Jeff Chimenti, and Reed Mathis. Bob Weir's RatDog, Scaring the Children with Weir and Rob Wasserman, Jay's Happy Sunshine Burger Joint, and the hip hop/jazz fusion band Alphabet Soup. He was one of the first drummers of Primus, playing with the band for around eight months in 1988 and later rejoining the band from 2010-2013.
made him a legend as well. Bobby was added to Bass Player Magazine’s Top 100 Bassists of all time in 2017. He made the cover of Bass Player Magazine in 2016. Bobby wrote a column for Bass Player from 2014 to 2016.
is a New Orleans based, American singer-songwriter, guitarist and producer. Papa Mali is known for his own standout shows, as well as maybe best known for his work with 7 Walkers with Bill Kreutzmann of the Dead and currently with the M&M's with Medeski and Stanton Moore and Robert Mercurio of Galactic. We can share a link for the new record if you would like to hear it (produced by John Chelew who produced a number of records for The Blind Boys of Alabama, Richard Thompson, John Hiatt, and Charlie Musslewhite among many others). 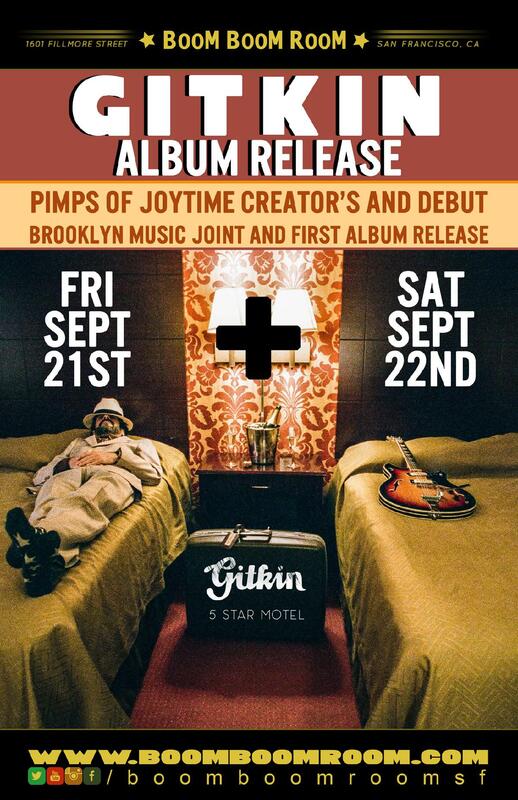 is the alter ego of Pimps Of Joytime front man Brian J. He calls the style "international psychedelic twang". He's put together a cast of stellar musicians including PJT original member, Chauncey Yearwood to bring the vibe to the stage. With styles ranging from Peruvian Chicha to 60’s Pakistani surf rock, Gitkin weaves a tapestry of sonic goodness featuring flavorful guitar stylings, hand clapping grooves and intriguing compositions. "It's all funk to me" says J when asked about the eclectic influences of the project. The debut album called ‘5 Star Motel’ is out now on Wonderwheel Recordings. 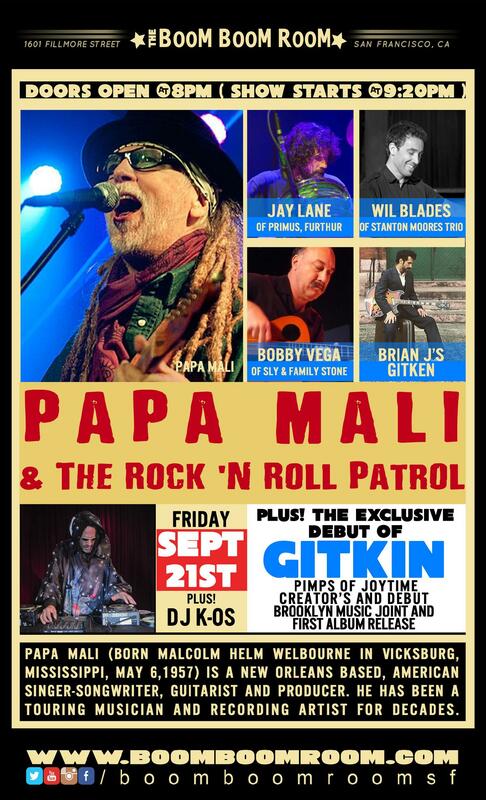 Gitkin will be performing his San Francisco debut supporting Papa Mali at the Boom Boom Room 9/21 and 9/22. The press blurb about the debut LP from Gitkin talks about inspiration coming from the artist’s wandering guitar salesman uncle and the international influences he came into contact with along the way. It makes sense of what is an unusual and magical fusion on a collection of tunes that are fully steeped in the musical language of Americana whilst drawing influence from all over the world. Heavy tremolo guitar lines of the kind usually heard in rockabilly or surf psych float over the top of shuffling afrofunk or Latin beats. It sounds like the soundtrack to an American road trip film that just keeps going through Central and Latin America, North Africa and Asia. Bobby has been playing and creating for over 4 decades. A Bay Area musician’s musician Bobby has since played with artists ranging from Joan Baez to Etta James. Bobby filled in when legendary Tower of Power bass player Francis “Rocco” Prestia had to take some extended leave. Bobby’s resume is so impressive it puts him not only on stage with the greats, but after over four decades, has made him a legend as well. Bobby was added to Bass Player Magazine’s Top 100 Bassists of all time in 2017. He made the cover of Bass Player Magazine in 2016. Bobby wrote a column for Bass Player from 2014 to 2016. Bobby was recognized in the May 2010 Bass Player Magazine commemorating on the 50th Anniversary of the Fender Jazz Bass. Jay Lane (born December 5, 1964) is an American drummer from the San Francisco Bay Area. He is a founding member of Furthur, as well as the Golden Gate Wingmen with John Kadlecik, Jeff Chimenti, and Reed Mathis. Bob Weir's RatDog, Scaring the Children with Weir and Rob Wasserman, Jay's Happy Sunshine Burger Joint, and the hip hop/jazz fusion band Alphabet Soup. He was one of the first drummers of Primus, playing with the band for around eight months in 1988 and later rejoining the band from 2010-2013.